Main dancer and singer of the K-pop girl group Twice. Formed by JYP Entertainment, the group was created through the reality show Sixteen and shortly after released their debut mini-album The Story Begins. A dancer even as a child, she was inspired to begin singing after discovering Namie Amuro. Prior to her debut with Twice, she appeared in the music video for Got7's "Stop Stop It." She was scouted by JYP Entertainment after they found a video of her and her sister dancing. Though both siblings auditioned for the agency, only Momo was selected. 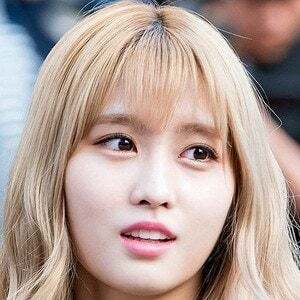 Some other members of Twice include Chou Tzu-yu, Son Chae-young, and Kim Dahyun.